Cumberland Farms is a regional chain of convenience stores based in Framingham, Massachusetts, operating primarily in New England, portions of the Mid-Atlantic region of the United States, and Florida. Cumberland Farms operates roughly 600 retail stores, gas stations, and a support system including petroleum and grocery distribution operations in 11 states, including Connecticut, Delaware, Florida, Massachusetts, Maine, New Hampshire, New Jersey, New York, Pennsylvania, Rhode Island, and Vermont. Its original colors were navy blue and orange, but in 2009, they rebranded with a new logo and colors (navy blue and green). The new logo change marked the beginning of the transformation of Cumberland Farms stores from older, legacy stores to new AIM stores that now include numerous new fresh food items such as pizza, chicken sandwiches, subs, and a roller grill. The company is owned by the Haseotes family, with Lily Haseotes Bentas formerly serving as CEO and Ari Haseotes currently serving as the President and COO of the Cumberland Gulf group of companies. It is one of the largest retail chains to be completely privately owned. 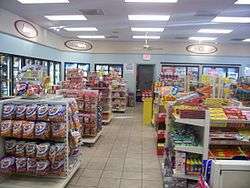 Cumberland Farms offers a large assortment of food service items, candy, snacks, and chilled drinks, which it calls "The Chill Zone", along with Cumberland Farms branded chips, pastries, candy, and coffee, etc. In 1938, Vasilios and Aphrodite Haseotes purchased a single-cow farm in Cumberland, Rhode Island, which eventually grew into the largest dairy farm in Southern New England. Cumberland Farms opened a dairy store in Bellingham, Massachusetts in 1958 and the first convenience store in the northeastern United States in 1962. In the late 1960s the Cumberland Farms had a successful ad campaign that helped expand their franchise, in part due to catchy jingles written by Brad Delp, who later went on to form the band Boston. Cumberland Farms has been a two-thirds limited partner in the Gulf Oil company since 1993, while it has owned the rights to sell gasoline under the Gulf name throughout the United States since 1986. Recent Cumberland Farms television ads have featured actor David Hasselhoff. ↑ 1/13/2010. Gulf Oil L.P. acquires brand rights for the entire US Boston.com. Accessed August 2011.